News that the Office of Fair Trading is launching an investigation into the housebuilding industry had me exclaiming “OK, but why now?” Nothing has really changed that much in the past ten or even twenty years; certainly not the nature of the cozy cartel that exists between the housebuilders, the planners and the amenity groups such as the Council of Preservation for Rural England (CPRE). Both the low rates of new housebuilding and the poor standards of that housebuilding are symptomatic of a general market failure, but then this is no ordinary market. The OFT would seem to want someone to blame for this state of affairs. Housebuilders point to intransigent planners, planners point at huge landbanks being held back to artificially inflate prices. According to the BBC website, the OFT have appointed an eight-strong team to take representations, but I expect them to get pushed from pillar to post and back, and to end up more or less back where they started. To my mind, the problem really starts with 1947 Town & Country Planning Act, which effectively nationalised land use. Instead of land being freely brought forward for building by whoever fancied their chances, the new planning authorities started ring-fencing areas suitable for development. As these areas were often large, the small players were effectively cut out from the market. Over the years, this policy of concentration and densification has grown more and more pronounced and the whole development process has been professionalised. The current consolidation going on in the housebuilding industry is merely the latest phase of a process that dates back to 1947. What the OFT should be looking at is how development took place in the 1920s and 30s, when there were very few controls and no massive national building concerns. There was genuine competition back then and also a high rate of housebuilding. Also they should look closely at what has been happening in Ireland. And France. And Germany. And Scandinavia. And North America. And Australia. They will quickly find out that what goes on in the UK is unique. Other countries build more houses and they generally have far fewer quality issues. Land is often set aside by rural communities for small developers and selfbuilders to create homes and thereby organically grow communities. New development isn’t restricted to all but a few mega-sites, as it is in the UK. Mega-sites may be regarded as sustainable, but they do nothing to enhance competition. The land supply in the UK is now so restricted that the whole process is managed by a small number of very large businesses, who carve up the cake between themselves. The fact that there is little competition is because there is often only one new housing site for miles around. But rather than blaming everybody or indeed anybody for letting this state of affairs come about, the OFT should come to realise pretty quickly that it’s a creation of our restrictive planning policies. If you really want to reform the housebuilding industry, that is where to start. I don’t think it’ll even be on the agenda. Good series of articles recently on home ventilation in Selfbuild & Design by Bob Matthews, the oldest surviving selfbuild writer in the business. In June, he summarised his findings. In July, he peered into the future. There simply aren’t that many writers out there who would even know where to begin in handling such an assignment. I hope his readers appreciated it. • SAP 2005 presumes a ventilation rate of 4 litres/second/occupant, that’s 14.4m3/hr each. I didn’t know that: it seems quite low. For four people living in a 350m3 house, that’s one air change every four hours. Conventionaly, we’ve worked on around one air change every two hours, but I don’t think there is much evidence that this ventilation rate is actually required. • That 4lts/sec/person requires 100watts of heat to keep at 20°C above outside temps. So for four people, that’s 400 w. And for double the amount of air changes, that would be 800w. Generally, ventilation systems are set up to move much larger amounts of air than this 4lts/sec/person would indicate, so there is a design inefficiency built into most systems. • Part F of the building regs suggests that you have a 10mm gap undercut on every door, to facilitate air movement around the house. A lot of people won’t like that because it increases noise transfer. • The default system of home ventilation is trickle vents for supply air extract fans in the wet rooms. Trickle vents must be 5000mm2 in dry rooms (inlets) and 2500mm2 in wet rooms (outlets). • Passive Stack Ventilation is one of the main alternatives. Trickle vents stay but the extract fans are replaced by air ducts rising from wet rooms to ridge. Kitchen extract requires 125mm tube, utility room, bathroom – 100mm, WC – 80mm or opening window. It doesn’t work in every configuration – bungalows are not tall enough and room-in-the-roof designs have nowhere to run the ducts, and some critics suggest that it only ever works intermittently anyway. • Assisted Passive Stack is where a fan is added to the system, to ensure it works at all times. • Central Extract: very similar to assisted passive stack. One fan in the loft pulls air from all the wet rooms. Works with smaller trickle vents than default, and lower extract rates, but designed for continuous operation. • Positive Input: in many ways the opposite to Central Extract. Instead of drawing air out of the house, it blows it in, putting the house as a whole under a slight positive pressure. The chief exponents of this system are Nuaire. I’ve been rude about Positive Input Ventilation before, but Bob is much more generous. 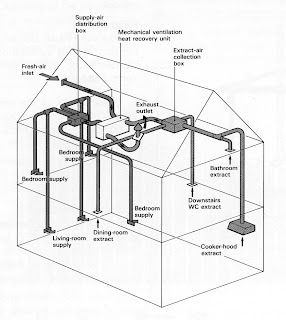 • Mechanical Ventilation with Heat Recovery (MVHR): discussed in some detail in recent post. Bob reckons that air leakage should be below 4 q50 (don’t ask – it’s a measurement of air leakage under pressure), which is much lower than we are currently achieving on non-manufactured houses. The current building reg standard is 10 q50, whilst the Passivhaus standard calls for 0.6 q50. Quite a difference. MVHR is the only system here that requires both input and output to be balanced, as they are both controlled by the fan or fans. Everything else is either entirely passive (i.e. no fans) or has fan controlled output or input (only one here). This balancing requirement is a crucial and little discussed feature of MVHR. I suspect it needs adjusting quite frequently but is rarely done. • Individual Room Ventilators with Heat Recovery: rather than whole house solution, you have a individual room ventilators with a heat recovery capability. Designed for continuous operation. And what did Bob speculate about in the later article? • He cast doubt the accepted mantra of the current generation of energy wonks: Build Tight, Ventilate Right. Systems like dynamic insulation (see recent post) mean that airtightness may not be quite the holy grail that it is held up to be. • Intelligent trickle vents, which self-adjust according to wind speed, air pressure and humidity levels. • Intelligent controls for mechanical ventilation: at the moment, it’s off/on/boost. In the future, systems may begin to emulate the sophistication now seen with space heating controls. • Supply Air Windows: Howarth are now making these windows which work by drawing air in between the two panes and pre-heating it on its way into the house. In effect, it’s a sort of heat recovery trickle vent, designed to work with the house under negative pressure, so usually installed with passive stack ventilation, or continuous central extract fan. • Earth tubes: these draw supply air through underground pipes in order to pre-heat or cool the air before it gets to the house. Much experimented with over the years, but nowhere widely adopted. There are fears about contamination and mould growth within the underground tubes and this seems to hold back more widespread adoption of the technique. • Dynamic Insulation: the capacity of walls and roofs to draw air in through their structure and to pre-heat it on its travels. A topic covered in a recent blog post here. 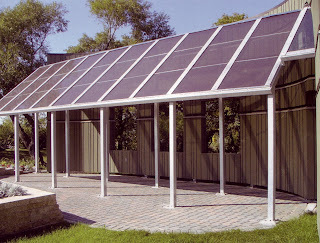 In fact, supply air windows, earth tubes and dynamic insulation are all ways of passively pre-heating the supply air. All have great potential but they are all also a long way from becoming mainstream. I particularly like Bob’s concluding remarks. In the future, we will probably reach more understanding about ventilation processes, and we will be able to design systems more accurately. Then there will be less need to over-ventilate in order to be on the safe side, as at present. There is a need for greater knowledge about the complex issues involved in domestic ventilation. A lot more research is required so that we can create healthy environment in our homes while at the same time minimising the damage we do to the environment as a whole. • Our understanding of house ventilation seems to be being driven by cold climate countries like Canada and Sweden, where ventilation is more critical. Does their take on it really transfer across to our lukewarm, maritime climate? • Specifically, is airtightness quite as important as we are being led to believe? • Are fully passive ventilation systems reliable? Or do we require fans to drive at least part of the system? • Should we be driving towards more sophisticated controls and sensors in order to balance running costs with air quality? Or is dumb good? • Are the health concerns about drawing supply air through ducting legitimate, or just a fear of the unknown? Having mumbled my way through more than my fair share of PowerPoint presentations, I am full of admiration for anyone who can talk clearly and coherently without slides or notes for fifteen minutes or more. 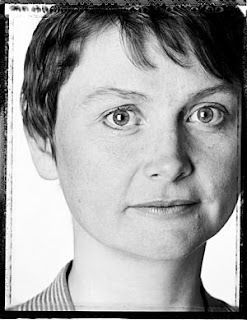 Housing minister Yvette Cooper, in common with many politicians, can do this. Hats off to her. Furthermore, she projects herself as both business-like and personable, the sort of neighbour who’d be great to have around in a crisis. Run out of milk? No problem, you can borrow a pint from us. Feed the cat for the weekend? We’d be delighted: you know we like your cat almost as much as we like living next to you. Thanks Yvette, you’re a good mate. But (and it’s a big but) being bright and on the button doesn’t make you right. At her exhibition opening address at Offsite 2007, she expanded on the twin aims of this government’s housing policy, these being to address the issues of affordability and sustainability. This is to be achieved by building more (lots more) sustainable and zero carbon homes, hopefully placing many of them into Eco Towns. This was music to the ears of the audience who comprised, for the most part, building professionals with a greenish tinge. Yvette doesn’t have a roadmap. She has the Barker report on her bedside table for those hot summer nights when the affairs of state get too much and she can’t sleep. Kate Barker has drawn a roadmap to account for affordability, which involves building more homes. Not that it’s a very detailed roadmap: had she taken a peek at what has just happened in Ireland, she might have come to a rather different conclusion. Ireland’s been having a massive housing boom and yet prices have been going up even faster than in the UK. Don’t tell Kate Barker, it might give her indigestion, and, lord knows, she doesn’t need that. But the other aspiration, to reduce carbon emissions; they hadn’t even thought to ask Kate Barker about those and so she hadn’t put them into her roadmap. So what Yvette and her friends have decided to do is to press ahead with Kate’s ideas but to make all the new houses much much greener. And that, dear reader, is basically the long and the short of this government’s housing policy. But it’s still several slices of meat short of the full sandwich. The image kept jumping into my head of a car driver (probably me) attempting to press both the brake and the accelerator simultaneously. That’s what it amounts to. You don’t reduce carbon emissions by building more houses, however green: all this does is slow the rate of growth. And building homes has bugger all affect on affordability either, unless you are happy to wait about 35 years to see any change. What we have, in effect, is a twin-pronged programme which will neither make houses more affordable nor reduce the emissions of the housing stock. What use is that? “But what about the existing stock?” asked someone in the audience. “We’ve thought of that,” answered Yvette. But, when it came down to it, it turned out to be a work in progress, something they were paying close attention to and hoped to have some proposals on shortly. I’ve heard that before. It’s always easier to avoid this tricky little issue as it involves forcing people to carry out works to their own homes, which is never a very popular thing to do. Hmm. How much more fun to get you builders out there to concoct some really novel designs and thereby gently coerce an unwilling population into changing their ways. The image of a few wind turbines spinning around (or not) on rooftops is just so much sexier, don’t you think? Last week, I went to visit Snaplite, a company making downlighters, based just outside Birmingham. It’s an unusual outfit, which has carved a niche for itself by concentrating on quality. Whereas the lighting market generally is awash with incredibly cheap Asian imports, Snaplite have chosen to manufacture their products in the West Midlands and to concentrate on providing well-built housings for the various lamps out there. The business is based largely around the skills of a guy called Peter Jones (not the tall one on Dragon’s Den) who likes to tinker around with lights in his garage. He hit on the idea of manufacturing fire-rated downlighters and Snaplite became the first company to offer these into the UK market in 1998. To date, they have been pitching themselves largely at professional housebuilders but now they are becoming interested in the selfbuild sector, which is how I came to be interviewing them, having met Anthony Ottway (pictured here with Graham Stevens) at the Homebuilding & Renovating show at the NEC in March, where they had taken stand space. If you go back a few years, to the 1980s, downlighters were regarded as sophisticated and aspirational. Back then, the ceiling-mounted spotlight was still the thing. People did use downlighters in the home but not that often. That started to change when low-voltage halogen lamps became fashionable. People saw what they did in shops and in restaurants and instantly they wanted that same effect back in the home. An industry was born. Not that this did our overall energy consumption any favours. Whilst low-voltage halogens are around twice as energy efficient as ordinary tungsten bulbs, you need a shed load of them to flood light a room. Instead of a modest house having perhaps 20 or 25 light central pendant fittings, a fully downlighted equivalent would probably use around 60 or 70, typically four in each small room and as many as ten in the main living areas. That’s an awful lot of lights. Anyone considering planning for energy efficiency would do well to bear that in mind. But it’s another aspect of building homes which brought Snaplite to prominence and that is the problems associated with making holes in ceilings. In the early days of downlighting, no one gave a toss. It was all regarded as part of the fun of using downlights, just a detail to be undertaken as quickly and cleanly as possible. But holes in ceilings are not good news. Although the devastating effects of fire spread through ceiling holes and socket boxes had been known for some time, the fire regs had always ignored them, preferring to concentrate on testing wall and ceiling assemblies built without penetrations. But holes for downlighters not only increase the risk of fire spread, they also let through noise and condensation, and they are a source of air leakage. Additionally, because downlighters burn hot, you need to leave space in the ceiling recess around each light. That’s a whole catalogue of construction woe. Rather than ignore these problemos, Snaplite hit on the wheeze of designing them out. It then hit on another wheeze of highlighting these problems to the housebuilding industry: their 1998 launch of the fire-rated downlighter made much of the problems raised by competitor products. Then came interest from the acoustic wonks. When Part E, the sound regs, were beefed up in 2003, a very similar concern surfaced: holes in ceilings were really bad news for people wanting to acoustically separate flats. A fire rated downlighter turned out to work pretty well as an acoustic downlighter as well; not surprising really, because the issue is pretty much the same. The downlighter has to be re-engineered so that the heat is directed down as opposed to being allowed to dissipate in the ceiling void, and the housing around it has to be made from pressed steel and it has to be reasonably airtight. There is, in effect, an integral fire hood. If you do all that, as Snaplite did, then your fitting is pretty much bound to be fire proof, airtight and acoustically-rated. So Snaplite has product which is fire rated (Part B), acoustically rated (Part E), doesn’t let condensation through (Part C), and is also airtight (Part L –airtightness requirements came into effect for the first time in 2006). Also because of the design of Snaplite’s downlighters, you could lay insulation across the back of them without having a break in the insulation. Competitor products required you to leave a large 600mm gap around the downlighter because they burned so hot. In an era where insulation was at last beginning to be taken seriously, leaving a hole that big made no sense. Of course, a Snaplite downlighter wasn’t cheap, especially when compared to stuff flooding in from China, retailing for two or three quid. But for a while no other downlighters even tried to compete in quality, and they carved out a good market with the more scrupulous builders, egged on by both local authority building control and the NHBC who were impressed by Snaplite’s approach. But these days, the competition is catching up. Snaplite are not the only show in town and wholesalers now stock various types of fire rated and acoustic rated downlighters at prices which undercut UK-made Snaplite’s output. Snaplite point out that the industry is full of sharks and that much of the so-called fire-rated kit on the market is nothing of the sort and that, furthermore, there is really no effective way of policing this situation. Their problem is that, having done all the hard work of establishing that ceiling penetrations are a problem, and engineering a solution, their market may be taken away from them by a bunch of cheapskates. The solution is of course to innovate still further, to stay one step ahead of the game. To this end, they are courting the selfbuild market in the hope that here is a group of specifiers who may be prepared to pay a little more for quality. With the increasing interest in energy efficiency, many selfbuilders want help in designing a low energy lighting scheme that looks good and provides good quality light. They have launched a compact fluorescent range called Emerald, which is designed for ambient lighting in halls and stairwells, and they have added a range of low energy pendants, wall lights and illuminated mirrors so that they have a more rounded range, the sort of thing which a selfbuilder might think of as a one stop shop. LEDs are beginning to feature in this range as well, although to date mostly as shelf lighting and in strips. Snaplite have also started offering a design service aimed at selfbuilders wanting both quality and energy efficiency. If you are looking at spending over £3,000 on a lighting scheme, which they argue is not an exorbitant amount for an upmarket house, Snaplite will undertake a design for you for £100, refunding £50 of this if and when an order gets placed. It’s an interesting proposition and one I can see may be attractive to a lot of selfbuilders.